Whoever came up with this cunning way of eating cake for breakfast, we thank you for your service to society. Mornings would not be the same without you. Carrier of syrups, berries, bacon, or pretty much anything you darn well please, pancakes are peerless and are usually the first thing we learn to whip up in the kitchen. This is no coincidence—if you can make pancakes, you're set for life. Waffles shmaffles—we love them but let's mix it up with a good ol’ fashion stack and a vat of maple syrup! 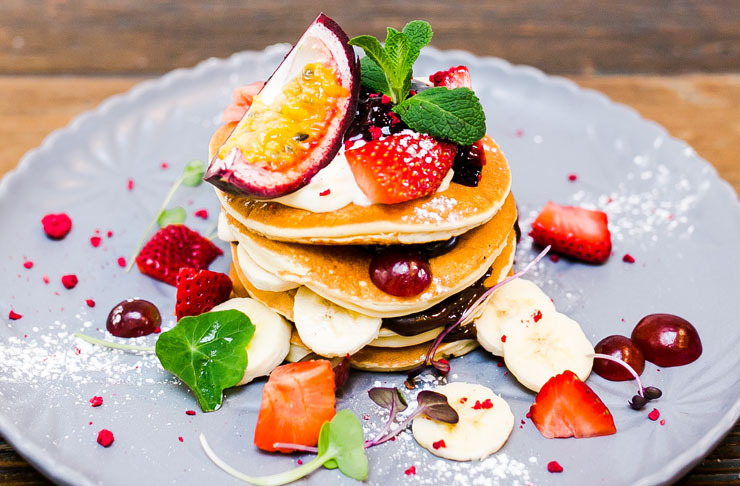 Here are some of Auckland’s best pancakes. We developed a bit of a crush on Ponsonby’s Foxtrot Parlour when we heard about their commitment to all things brunchy and delicious. It quickly escalated to a full-blown romance as soon as we saw their signature pancake served with roasted peanuts, vanilla ice cream and... wait for it... coconut-infused sauce. Swoon! We can always count on Circus Circus to serve up a classic Kiwi breakfast. So it's no suprise their vanilla pancakes are anything short of delicious. Accompanied by all the extras, your fluffy pancake comes with caramelised banana, toffee, walnut and whipped butter. Holy YUM. Be sure to score yourself one of their infamous coffees served in a bowl, they're our fave. When it comes to hotcakes, Bambina doesn’t do things by halves. Their blueberry ricotta hotcake is served with fresh berries, mascarpone, seeds, millet puff, maple AND edible flowers. They don’t skimp out on toppings here—this hotcake is stacked high! It’s pretty, tasty and oh-so Instagrammable. A great spot for pancakes in Auckland! Sweetening up the North Shore is Honey Café. The Takapuna café takes a cleaner twist on the ol' hotcakes, boasting a gluten free orange ricotta protein pancake (!!). This badboy is topped with berry compote, honey comb macarpone and vanilla maple syrup. We recommend adding on bacon—because everything tastes better with a few rashers. Honey Cafe is certainly serving up some of the best pancakes in Auckland. Did someone say Buckwheat Hotcakes? Winona Forever is winning over our hearts with every dish! 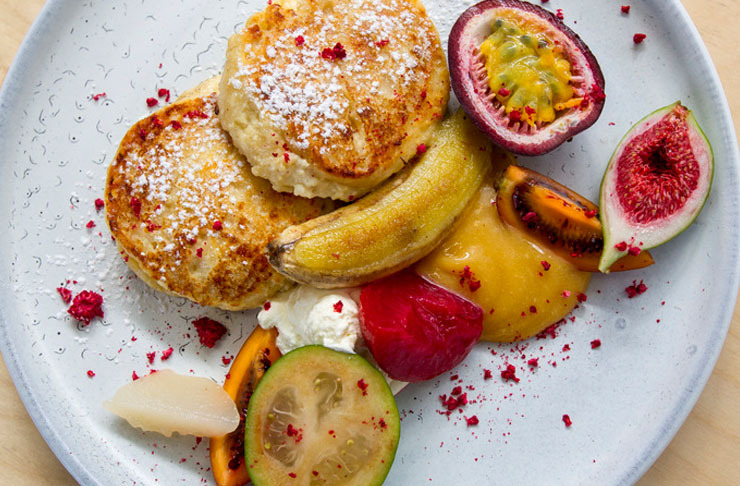 These decadent hotcakes come equipped with organic maple, coconut yoghurt and a medjool date paste—who said healthy was boring. We recommend grabbing a hella' good peanut butter and jam smoothie on the side. Turns out Auckland is pancake heaven! Operating from what may be the smallest kiosk in Auckland, is No. 1 Pancake. Popular with both business-people and students alike, the kiosk often has a queue of people waiting to get their mitts on the cheap and delicious Korean-style pancakes. Here the pancakes are stuffed with fillings (anyone for a ham, cheese and pineapple pancake?) and cooked to crispy perfection. If there's one think we're certain about, it's that Moloko Cafe serves up one of the best pancakes in Auckland. Taking a European twist on things, the team boast a Russian ricotta pancake served with grilled banana, berries, sour cream and lemon honey—mmm. What's more, ya can top this with pork belly (!) or bacon. Bringing the fermented food trend to pancakes is Little Bird Unbakery. The Ponsonby eatery serves a savoury pancake made with a delicious (and healthy) combination of chickpea and kimchi. The pancake is then topped with avocado, leafy greens and wait for it... a sweet chilli and cashew aioli. While it’s a lil different to the traditional pancakes we all know and love, we promise it’s very VERY tasty. Just because you’re competing in NZIFBB needn’t mean you have to give up pancakes. Jam Organic Café serves figure-friendly protein hotcakes in a glorious fashion. Made with vanilla whey, these hotcakes will go straight to your biceps. They’re topped with spiced poached pears, maple, berry coulis and yoghurt. Protein shakes and Quest bars have nothing on this. Looking for pancakes in Auckland? While we’re sure Domain & Ayr has an extensive breakfast menu, we wouldn’t know because we’re too caught up in their fluffy 20-minute pancake. It’s soft, it’s fluffy and it’s bigger than any pancake you’ve seen before. Served with mixed berries and mascarpone and drizzled with maple syrup, this famous pancake is worth every minute of the wait. If you thought New Flavour was only good for dumplings, think again! The iconic Dominion Road eatery also knows a thing or two about pancakes. There’s a pancake offering starring almost every meat imaginable: pork, beef, chicken, seafood and prawn. Personally, we can’t go past their sweet red bean-stuffed pancake. It sounds weird, we know, but we promise it’s jolly tasty. The best part? This pancake costs a measly $5. Your sunny brunch in the sun just got taken up a notch, because St Heliers Bay Café & Bistro do one fine and dandy pancake dish. We're talking sweet hotcakes accompanied by apple, vanilla mousse and fennel syrup...Hangry yet? We're not gonna lie, that pre-brunch walk you just finished was a little pointless. Finally, Auckland gets an American twist on our favourite pancakes! Catroux serves up pumpkin pie pancakes with vanille crème, caramelized banana, black sesame maple and none other than Lewis Road salted butter. If you live in Westmere and are yet to try this, we are a little offended. 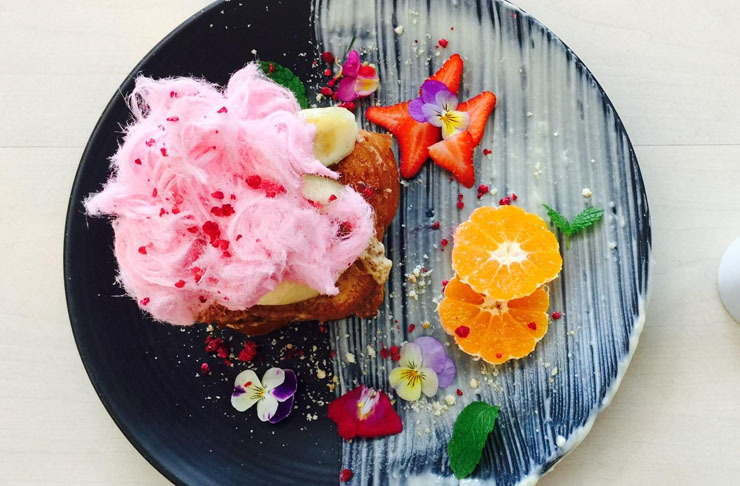 It's next level fabbo, and some of the best pancakes in Auckland.